When will I be an adult? Anyone under the age of eighteen is referred to as a minor, a child, a juvenile, or an adolescent. The term used depends on the situation. 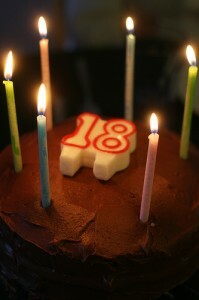 Once you turn eighteen, you′re legally an adult, with all of the rights and obligations of adulthood. Turning eighteen, or the “age of majority” (in most states), entitles you to complete independence—in most situations. You can enjoy the freedom to move away from home, buy a car, work full-time or travel, marry, vote, and join the armed services. In other words, major decisions about your life are yours to make. This is not to say that your parents are automatically excluded, especially if they continue to support you. There′s nothing magical about turning eighteen. The legal rights you now enjoy are balanced with obligations and responsibilities. In some states, you may be considered an adult even if you’re under 18. For criminal prosecution purposes, adulthood is set at age 17 in approximately a dozen states. As of 2011, New York and North Carolina set the age at 16. These ages are always subject to change depending on the state legislatures in those states. The movement seems to be away from the lower ages since the Supreme Court’s decisions in Roper v. Simmons in 2005 and Graham v. Florida in 2010. Those cases analyzed the development of the adolescent brain and found that full adult responsibility for actions isn’t complete until one is in their early twenties. Consequently, the death penalty for minors was found unconstitutional (Roper) as well as a life sentence without the possibility of parole in non-homicide cases (Graham).